Washington (CNN) - A second-straight national poll indicates that many Americans have shifted their priorities when it comes to immigration reform. According to a Gallup survey released Monday, 44% of those surveyed say it's extremely important for the United States to develop a plan to deal with the large number of undocumented immigrants. Forty-three percent say the top priority should be beefing up border security to halt the flow of undocumented workers into the country. That's a shift from 2011, when Gallup polling indicated border security trumped dealing with immigrants already in the country. "Compared with 2011, Americans of all partisan orientations have come to view border security as less important. Meanwhile, their views on the importance of devising a plan to deal with illegal immigrants already in the United States have been largely stable," said a release by Gallup. The Gallup poll follows the release earlier this month of a CNN/ORC International poll that indicated a majority of the public said the government's main focus should be legalizing the status of the undocumented rather than border security. According to the CNN survey, 54% said the top priority for the government in dealing with the issue of illegal immigration should be developing a plan that would allow those with jobs to eventually become legal U.S. residents. Just over four in 10 of those questioned said the main focus should be developing a plan for stopping the flow of undocumented immigrants into the United States and for deporting those already here. The CNN poll also found that attitudes have shifted since 2011. "Starting in 2012, most Americans have said that the government's focus should be on a plan that would allow those immigrants to become legal U.S. residents. A majority has consistently taken that position since that time - 56% in 2012, 53% in 2013, and 54% in the current poll," said CNN Polling Director Keating Holland. The Democratic-controlled Senate approved a bipartisan immigration bill last year that included an eventual path toward citizenship for most of the 11 million undocumented immigrants in the United States. The Senate bill stalled in the GOP-led House. Republicans said they preferred to address the matter incrementally rather than in one comprehensive measure. Earlier this month, House Speaker John Boehner signaled any action on immigration is unlikely this year because he said Republicans in the chamber don't trust President Barack Obama on the issue. The Gallup poll was conducted February 6-9, with 1,023 adults nationwide questioned by telephone. The survey's overall sampling error is plus or minus four percentage points. The CNN poll was conducted by ORC International from January 31-February 2, with 1,010 adults nationwide questioned by telephone. The survey's overall sampling error is plus or minus three percentage points. Our situation is unique, and requires a unique solution that goes beyond a fence, fines, deportation, and xenophobia. The ONLY thing unique about our situation is that we have a government and a Democrat Party that refuses to enforce all of our immigration laws. Other countries do not encourage and reward law breakers, they arrest, punish and deport them. Why do the Democrats support and encourage these illegals? If new laws are passed, will you still refuse to enforce the borders and arrest and deport all illegals? Of course, you will still refuse to enforce the new law, just as you refused to enforce the old laws. Are these people in the picture actually holding up signs that say "Respect"? What "respect" did these law breakers show for our laws and our sovereignty? NONE. Now they protest and demand "respect" from US?!! Are they serious? All I can say is that they are darn lucky that I am not President because if I was I would arrest and deport every single one of them and teach them what it means to respect this country and its laws. Why doesnt everyman just go to his tent. Americans travel to countries they like but adopt every restrictive practice to prevent immigration. This is the prime cause of illegal immigration. I am here ILLEGALLY and DEMAND my RIGHTS, including CITIZENSHIP!! 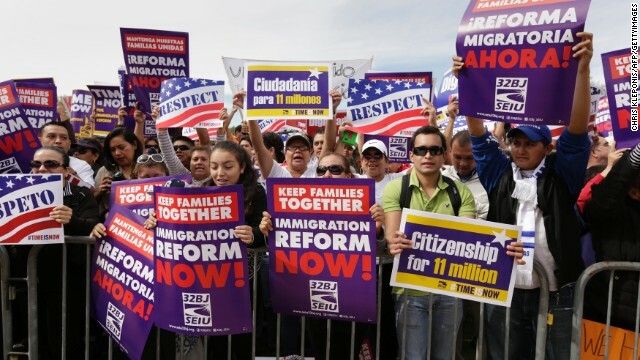 Anybody notice the sign in front that says "Citizenship for 11 Million"? The goal of the Democrat Party front and center for all to see. Amnesty and citizenship for criminals.